Retaining walls are a great addition to any landscape setting; they add both aesthetic appeal and functionality to any residential or commercial landscape. Preferred Landscape has been installing retaining walls for many years throughout the greater Louisville, Kentucky region. We will custom design a wall to suit the needs and requirements of your particular property. Retaining Walls are often installed to enable the use of sloped plots of land that are otherwise useless or just simply a waste of space. Wouldn't you like to be able to plant some garden beds or perhaps install a water features in these bare areas. Well let our teams turn those once unusable parcels of your landscape into something really eye-catching and unique. Our designers have all of the knowledge and experience to solve even the most challenging of cases. We have dealt with a vast range of landscapes and we will do the job right and on time! Our team of retaining wall professionals has been great building walls for a long time. When it comes to the building of walls it is always best to seek the help of a professional landscaping company like Preferred Landscape. Depending on the height of the retaining wall you need built; there are certain standards and building codes that must be adhered to. So let us take all the hassle and stress out of your wall project for you. We know all the ins and outs and will take care of your project from start to finish. Our landscape contractors will install a retaining wall that is not only beautiful to look at but one that will be structurally sound, solid and withstand the test of time. You will be so delighted when you see the possibilities created by the addition of a retaining wall on your property! 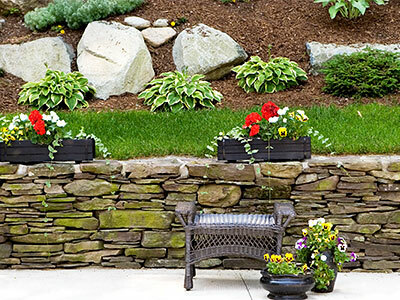 Preferred Landscape has a team of landscape designers that will sit down with you and help you choose the right type of material to construct your retaining wall. Your budget is always a good starting point, but it is also a good idea to look at the other materials used around your property. If you have a brick home you want to continue the theme and have a brick retaining wall. The possibilities are endless when it comes to retaining wall material these days. There is a large range of wall products on the market today; with many colors, sizes, shapes and textures to choose from. Natural stone products are very popular but are a little more expensive when compared to other manufactured concrete products. These concrete products are produced to imitate the look of natural stone but without the extra expense. It really is up to you and what type of look you want to go for, we understand that each client is different and has a unique sense of style and taste. 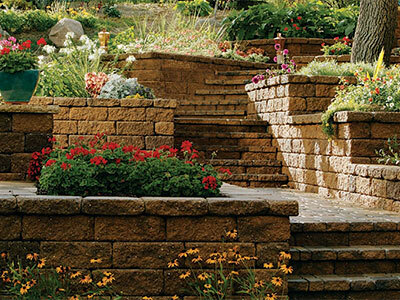 Preferred Landscape is committed to installing you a retaining wall that you will be proud of!